This highly moisturizing cream has a medically certified composition that makes use of herbal ingredients, such as rose, aloe vera, and lime extract. Those, who are skeptical of using chemicals, can opt for this hair removal cream for a reduced and softer growth. It also comes with sandalwood extract that gives a glow to the skin. Price: Rs. 35 for 40 g.
Anne French is one of the most well-known brands, which has now come up with a new improved formulation. It removes hair right from the root and moisturizes it profoundly to leave your skin softer and smoother than ever before. It is available for normal to dry skin and for sensitive skin as well. Price: Rs. 60 for 40 g.
Sensitive-skinned beauties, who want to shave off the unwanted hair without any side effect, can opt for this cream for gentle and effective hair removal. It is an advanced formulation that contains a blend of natural skin nourishing and smoothening ingredients, such as lavender and aloe vera extract. Additionally, it has lemon, orange, and vitamin C which help in giving a smooth glow to the skin. Price: Rs. 95 for 25 g.
It is a dermatologically-tested composition that helps you retain the smoothness, softness, and silkiness of your skin throughout the process of hair removal. It is enriched with wheat germ oil and aloe vera extract to replenish the skin with its natural moisture and keep it hydrated by developing a protective layer. The cream is specially developed to work close to the root of the hair so that the unwanted hair can be removed effortlessly and the new hair takes a longer time to grow back. Price: Rs. 44 for 40 g.
As the name suggests, it is a 3-minute hair removing cream that turns out to be extremely handy for working women. If you are in hurry and need to get rid of unwanted hair quickly, this should be your go-to cream. It not only produces quick results but also takes good care of the skin with its reliable herbal formula of aloe vera and almond oil. Price: Rs. 55 for 40 g.
This cream comprises all natural herbal ingredients that make it completely free from side effects. it helps you eliminate unwanted hair in a gentle yet effective manner so that your skin becomes smooth and silky. On the other hand, the herbal composition ensures that the product does not leave dark spots or pigmentation marks on the skin during the procedure. This supreme quality cream comes handy in shaving off unwanted body hair quickly. It is affordable and is processed with a special formula that removes hair in as less as 5 minutes. The product has a pleasing fragrance of rose, sandal, and lemon while their natural extracts make the skin soft, smooth, and moisturized. Price: Rs. 20 for 35 g.
Here is another great choice from the brand VI John, which can make your skin look amazing after removing hair. Being one of the top brands in the market, it promises effective hair removal in just a few minutes to give you a clean skin surface. It uses a blend of saffron and honey, which results in utmost smoothness and beautiful glow of the skin. This economical hair removal cream contains rose, lemon, and sandalwood extracts along with special moisturizers to ensure that the skin remains soft and smooth after removing hair. It does not leave dark patches and you will be able to get flawless, glowing skin after each session. Price: Rs. 75 for 50 g.
When talking about the best hair removal creams, Veet deserves a top mention. It is the recommended choice for women of all skin types and provides by far the best possible results. It makes use of shea butter, berry, rose extracts, olive oil, and even strawberry extracts to come up with amazing formulae that removes unwanted body hair like a breeze while leaving the skin beautifully soft, smooth, and fragrant. Price: Rs. 110 for 50 g.
Hair removal creams are meant to use on specific body parts, such as arms, underarms, legs, and bikini line. Never ever use them on your scalp, face, breasts, or genital areas. Be it your first-time use or first use on a certain part of the body, always start with a ‘Patch Test’ to know how your skin is going to react, thereby avoiding any unexpected circumstances in the very first place. Strictly follow the ‘Directions For Use’ mentioned in the carton. 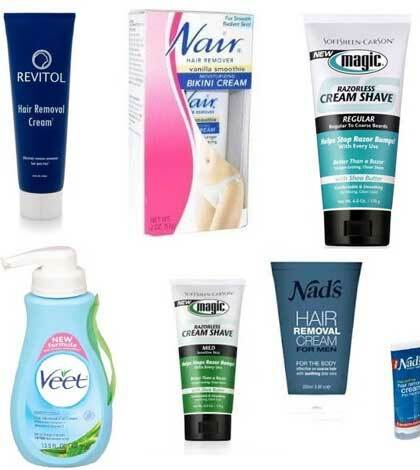 Though it is more or less same for all creams, you should stick to what instructed by your preferred brand only. If you have just taken a hot bath or shower, stay away from using hair removal creams on your skin right away. Once you use a cream for removing unwanted hair, do not use any deodorant, antiperspirant, or other perfumed product for at least 24 hours. Do not go for sunbathing or swimming up to 24 hours of the usage of a hair removal cream. There must be a gap of minimum 72 hours between two consecutive hair removal sessions using creams.